Maggie is a Nashville native who moved to Chattanooga to receive her Bachelor’s Degree in Entrepreneurship & Marketing. 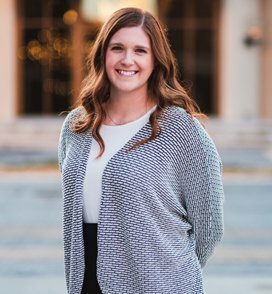 Upon graduation, she started a full time position as an administrative assistant, where she gained experience in organization and communication. She was first introduced into the wedding industry by her sister, who is a florist in the area. Maggie fell in love with the wedding industry after interning with us at Wildflower Wedding Planning, where she is now an Event Coordinator. Her favorite part about wedding coordinating is meeting the incredible bride & groom, vendors, guests, etc. and being a part in creating a beautiful day.